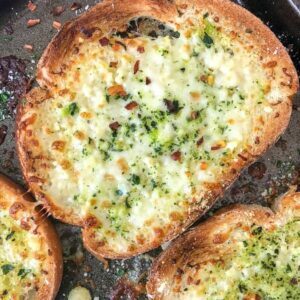 Easy and Quick Garlic Cheese Bread – it doesn’t get much better than an easy recipe like this that give you a warm slice of cheesy garlic bread straight out of the oven! Comes together in minutes with a handful of ingredients I guarantee you already have in your kitchen. What do you do when you have leftover bread that’s been sitting in your cupboard for some time and your husband just brought home a “deal” on bread, leaving you with an abundance of delicious carbs? 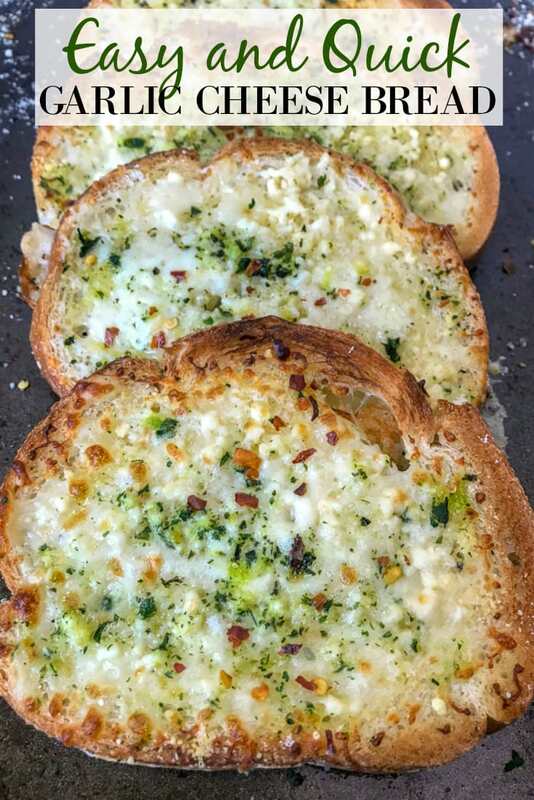 YOU MAKE GARLIC CHEESE BREAD, of course! I remember making these with my dad when I was younger. 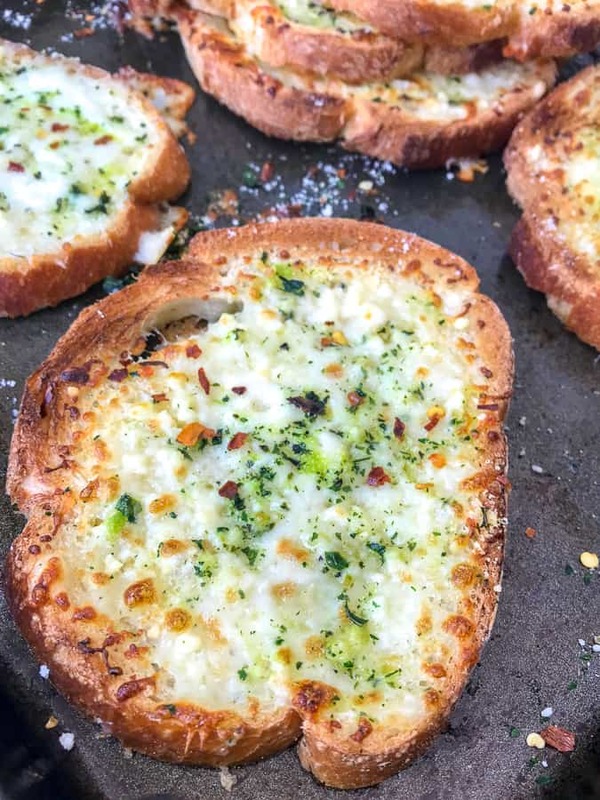 They are the perfect, easy and cheap option when you don’t want to buy pre-made, boxed garlic bread and want to have something to scoop up that meaty spaghetti sauce with! I grew up with parents who lived paycheck to paycheck, so it was essential to cut corners and get creative where you could. 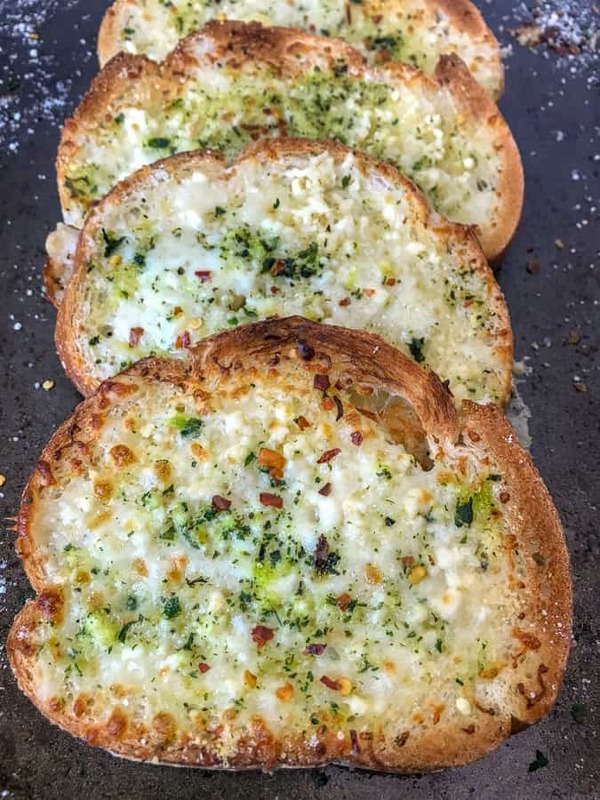 Which is the main reason we made our own garlic bread; it was bread we already had on hand that didn’t require spending any extra money for the pre-made kind, therefore saving us a few dollars to put towards something a bit more important. It was either homemade garlic cheese bread or cinnamon sugar bread. Anyone else make that as a kid?? You toast a slice of bread, butter it, and then sprinkle cinnamon sugar on top! SO GOOD! I have such fond memories of my dad making that for my brother and me as kids for movie nights. If you haven’t try it – give it a go! Crispy Parmesan Chicken Meatballs – the perfect recipe to pair this Easy and Quick Garlic Cheese Bread with to scoop up the sauce! 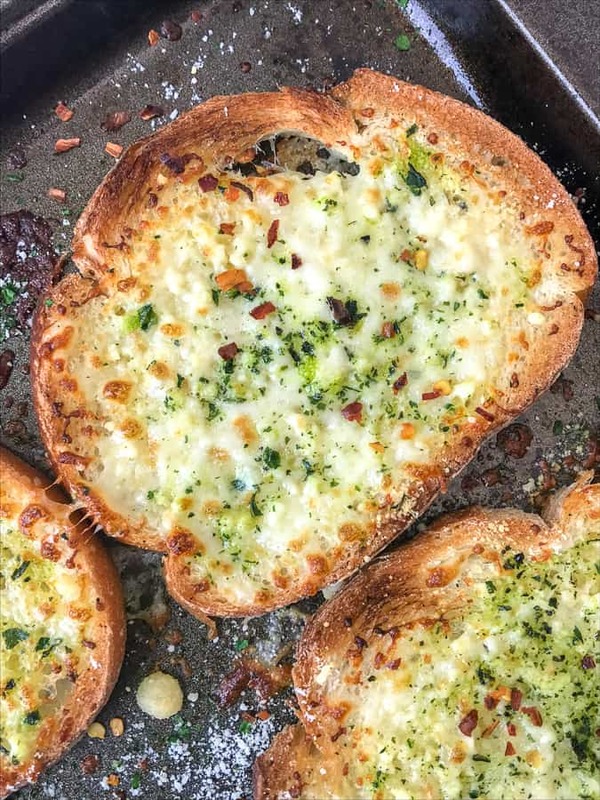 Or sandwich some of the meatballs between two slices of this garlic cheese bread for an incredible flavor-bomb sandwich! I have the best ideas, I know. Crispy Baked Chicken Parmesan Zoodle Bowls – low-carb and easy recipe with the crispiest, most flavorful chicken parmesan! Mini Cauliflower Pepperoni Pizzas – low-carb cauliflower pizza’s paired with carb-filled garlic cheese bread?? Hey, life is all about balance, alright? Creamy Garlic Parmesan and Roasted Red Pepper Chicken – soak up the excess sauce! Super simple and comes together in minutes with a handful of ingredients! 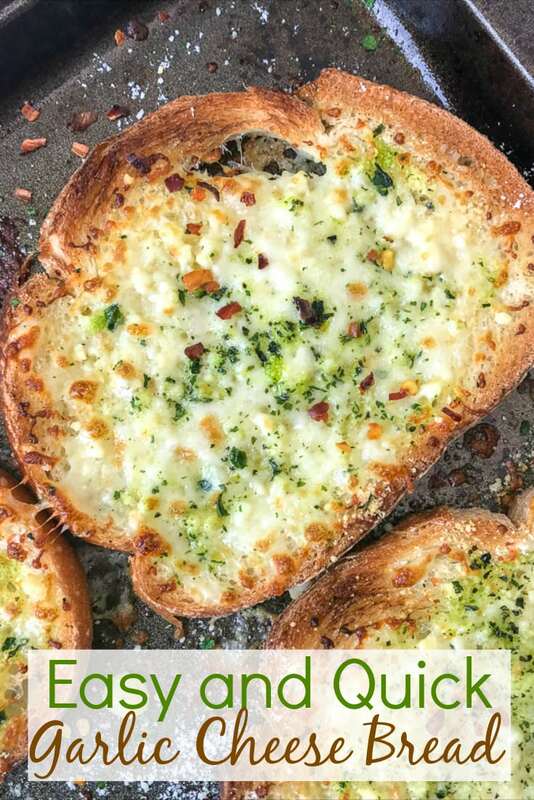 Full of garlicky, cheesy flavor and the perfect easy bread to soak up your spaghetti sauce! Raise oven rack to the top rack and preheat the oven to broil on LOW. Lay 6 slices of italian bread onto a baking sheet. To each slice spread: 1.5 tsp of butter, 1/2 tsp minced garlic, 2 tbsp freshly grated mozzarella cheese, and 1 tsp parmesan cheese. Sprinkle the parsley and basil over the tops of each one. Place into the oven, under the broiler, for 3-4 minutes, or until the cheese starts to brown and the edges crisp. Remove and garnish with additional parmesan cheese and crushed red pepper flakes (optional).